An institute that launched with $9 million in unspent funds from Sen. John McCain’s failed 2008 presidential campaign has been likened to the Clinton Global Initiative and linked to billionaire leftist George Soros. Sen. John McCain and George Soros reportedly became friends after the ‘Keating Five’ scandal. Critics from the left and right believe the institute “constitutes a major conflict of interest for McCain,” chairman of the powerful Senate Armed Services Committee, according to a report by the Daily Caller News Foundation’s Investigative Group. The organization’s exclusive “Sedona Forum” bears “an uncanny resemblance to the glitzy Clinton Global Initiative that annually co-mingled special interests and powerful political players in alleged pay-to-play schemes,” the Daily Caller report said. The institute accepted a $100,000 contribution from Soros. 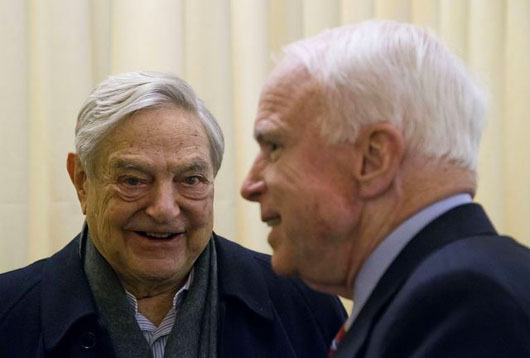 The experience “so scarred McCain that he became a vigorous advocate of campaign finance reform” and in the process reportedly became friends with Soros, the report said. “Teneo has long helped enrich Clinton through lucrative speaking and business deals,” the Daily Caller report said. Bloomberg reported in 2016 on a $1 million Saudi Arabian donation to the institute, a contribution the McCain group has refused to explain publicly. In addition, the institute has taken at least $100,000 from a Moroccan state-run company tied to repeated charges of worker abuse and exploitation, the Daily Caller report said, adding that the group has also accepted at least $100,000 from the Pivotal Foundation, which was created by Francis Najafi who owns the Pivotal Group, a private equity and real estate firm. The NIAC is “Iran’s lobbyists in Washington,” said Aresh Salih, the Washington representative of the Democratic Party of Iranian Kurdistan. “People inside of Iran know them as their lobbyists in Washington, D.C.,” Salih told the Daily Caller. Lawrence Noble, general counsel for the Campaign Legal Center, told the Daily Caller that accepting contributions in the name of a sitting senator like McCain raises troubling issues.